We have a long term interest in the enzymology of Coenzyme A, both the pathway up to pantothenate (vitamin B5) (present in plants, microorganisms and fungi) and the pathway from pantothenate to Coenzyme A (present in all cells) [Nat. Prod. Rep. 2004]. 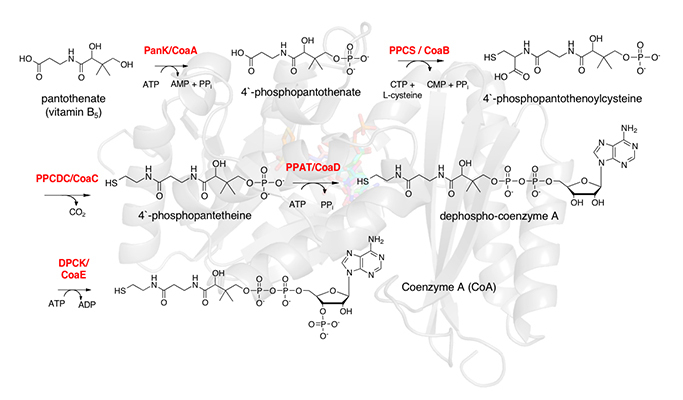 We have a specific interest in targeting the coenzyme A pathway enzymes (CoaBC, CoaD, CoaE) from Mycobacterium tuberculosis. We use a range of biophysical techniques including thermal shift, NMR spectroscopy, ITC and X-ray crystallography to identify fragments that bind to these enzymes. These fragments act as starting points for elaboration to potent enzyme inhibitors. Our research in this area is in collaboration with Professor Tom Blundell (Biochemistry), Professor Val Mizrahi (University of Cape Town), Dr Clifton Barry III, Dr Helena Boshoff (NIH Bethesda, USA) and Dr Christina Spry (Australian National University).